PPT to EXE Converter Pro is an application that will help you to convert PowerPoint presentations (PPT) into professional self-running EXE files. The EXE files can be copied to any computer and will run on Windows 2000 (SP4 or newer), XP (SP1 or newer), 2003, Vista or 7 without requiring any additional program files. If you want to send someone your PowerPoint presentation, or distribute it via the internet or through data CDs, the best way to ensure that everyone can view your presentation (no matter whether they have installed the needed version of PowerPoint on their computers) is to convert to a self-running EXE file using PPT to EXE Converter. PPT to EXE Converter Pro do not require Microsoft PowerPoint. And, the self-running exe file converted does not require Microsoft PowerPoint on your viewer's computer. 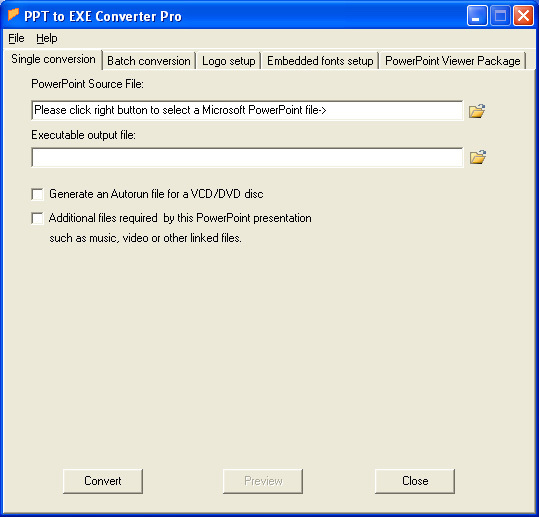 PPT to EXE Converter Pro can do Single conversion and Batch conversion. PPT to EXE Converter Pro can help you to generate your own output exe file, such as : you can assign icon images for output exe file and config your picture images before or after presentation. You can also embed special fonts that powerpoint can not embed. This feature will help you distribute output Exe universally around the world, irrespective of whether other computer has the particular font installed, which you have used preparing your PPT files. You can choose which PowerPoint Viewer Version( PowerPoint Viewer 2007, PowerPoint Viewer 2003, PowerPoint Viewer 97) would be packaged depend on what your need. Please visit www.vaysoft.com for details! This site does not contain serial number, crack, keygen PPT to EXE Converter Pro serial number : serial number is the simplest type of crack. A serial number(cdkey,product key,etc) is register the program as you may already know. a crack or keygen may contain harmful software. If you cannot find the exact version you want, just give it a try. for more information read .nfo/.txt/.diz file include in zipped file.